Not to be confused with a plot twist, Blood Rush puts the main characters into the bad situation immediately and it just deteriorates. The whole movie is just one bad situation. Characters have often, in film, tv, comics etc, had to fight their way out tough spots, but what if all you could do is hang there…. upside down??? Yeah, that is completely F-ed. We noticed the same thing. Is the movie called Flipped or is it called Blood Rush? What gives? Well the geeks asked Harris and we found out at the last second the distributors wanted to change the name. Distribution is king (we know!) so it made sense for the movie to have a more visceral title. That and there are probably 84 other films named Flipped, it was probably a good idea. You can find out more about Blood Rush at IMDB and you can watch it on your favorite VOD platform such as Amazon and more! Please read below on how I rate my movies so you can get a sense of what to expect. What would you do if your world had been quite literally Flipped upside-down? Our story starts with Scotty Dee (Think Justin Bieber type played by Evan Taubenfeld) and “Model” Nicole Diamond. They are at a restaurant, they seem like the perfect celebrity couple, and then BAM! car into a ditch. Life goes from perfect to f-ed in an instant. 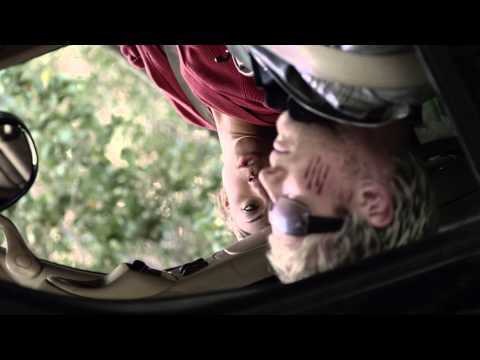 Our main character, who incidentally was actually suspended upside-down for the shooting of this film, Nicole Diamond played by the beautiful Stella Maeve, finds herself pinned under the dashboard unable to move. Phone smashed, and that god awful in-car Siri/Sync system not working (command not recognized! ), Nicole finds herself unable to call for help. Her 1987 Black Berry has only a few buttons that work and she is forced to start dialing random numbers. When she finally gets hold of some one, the voice on the other end is that of a self-described nice guy who is ready to “help”. The voice on the phone, voice-over by Mr Blonde himself, Michael Madsen, talks Nicole through this tough time. He let’s her know help is on the way, and decides to fill the time with her by talking through her relationship issues with Scotty Dee, who is conveniently also hanging upside down in the seat next to her. This movie is really about relationships. It is about celebrity, the price of such, as well as what happens when we actually bother to take our world and flip it on its head. We are sometimes forced to confront our own shortcomings as well as those of our partners. We come out the other side either with an intact, stronger relationship OR a house-cleaning and moving on our way. Madsen is absolutely superb. That gravely voice and his ability to play a seemingly sincere, yet disturbed individual comes out well over the phone. Stella Maeve does an equally admirable job playing the shallow model, consumed by her own celebrity that is mostly in her own mind. The change in facial expressions she pulls off is subtle, but excellent. As she gets more and more understanding of her situation, no only being pinned in a car, but her situation in her relationship with Scotty Dee, she slowly adapts her expressions to fit the mood. Very well done IMHO. One thing I did not like about the movie is that both Stella Maeve and Evan Taubenfeld both look just as good upside down as they do right side up! Their symmetrical faces do not seem to be effected by the reverse of gravity. Annoying that beautiful people always look beautiful…. Overall I enjoyed the movie because I took it for what it is, a movie about a relationship. You have a lot of time to think when you are hanging upside down in a car. I have rated well over 700 movies on IMDb, and written reviews for quite a few. I try to take a scientific approach and as a result, my ratings fit a bell-curve pattern as would be expected over a large sample set. I am slightly skewed on the tail (Hey, when I hate a movie I hate it) and slightly under represented on the head (Hard to find a perfect 10 IMHO).